In a world filled with yoga classes utilizing everything from stand up paddle boards to silk scarves hanging from the ceiling to accessorize the asanas, it is easy to lose track of the original intent of the postural practice. Asana is not just a set of exercises for a great physique. It was created as a tool for proper alignment and balancing of the physical body so that we can sit quietly in meditation to perceive our true nature. The danger of separating yoga asana from meditation is that it can actually fuel the very body identification that the yogic scriptures warn is the reason for our perception of limitation and separation. By relegating the teaching of yoga solely to physical practice, we lose its true meaning and purpose – the unification of our individual consciousness with Universal Consciousness. On the other hand, realigned with its intended purpose, yoga asana becomes a powerful practice to bring us out of disharmony. In the same way that we choose a proper diet in order to have optimal energy for our chosen pursuits in life, we can select proper asana for our bodies on a daily basis to enable stillness when we meditate. We can recognize the fluctuations we all experience between states of inactivity (tamas) and overactivity (ragas) and choose practices that bring us back into harmonious balance (sattwa). Yoga asana and yoga meditation then hold space for each other in the beautiful way they are meant to -- for our healing into the sattwic state of clear perception and the experience of our true nature. In the classical text the Yoga Sutras, the great sage Sri Patanjali outlines the path necessary for liberating our consciousness from the suffering caused by our five senses. 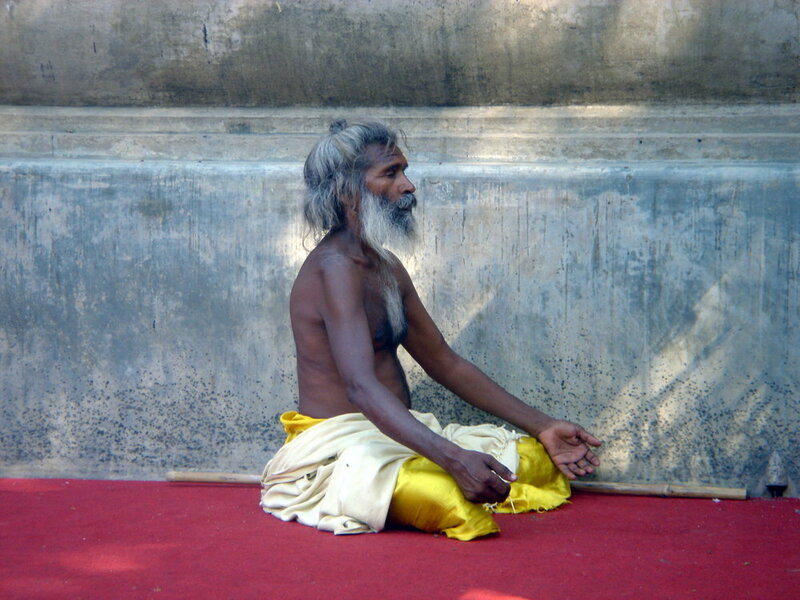 In a succinct presentation of eight branches of practice, he leads us through the necessary integration of our inner and outer lives (yamas and niyamas); the harmonious rebalancing of body and breath (asana and pranayama); the control of our senses (pratyahara); and the discipline of the mind (dharana). After integrating the work of the other six limbs, we become ready to turn away from all of the above, and sit quietly in meditation (dhyana). The discipline of coming to our cushions to practice sitting in stillness is the action that we call meditation and this is usually necessary before we can reach the state of being that meditation actually is. Once the state of stillness is consistently achieved, every posture, every breath, every relationship we enter is experienced anew as meditation. The abundant gifts of pleasure and experience that the Divine has created in this human playground are delightful, even ecstatic at times, yet everyone who has sought fulfillment through the senses knows that they can only take us so far. The sensory threshold must be left behind to fully reunite with the transcendent, immaterial and immutable state of our true Being. Then and only then can we return to the sensory world with the discretion, to utilize our senses with awareness, gratitude, and nonattachment. In this way, we no longer suffer from the fluctuations of duality. In meditation, when the mind and the senses rest, we perceive the greater Self. This is why we practice yama, niyama, asana, pranayama, pratyahara and dharana. Our souls know their innate completeness and will never be satisfied with the partial experience of self that can be had through the body. The eternal nectar of bliss (amrit) cannot be reached no matter how relentlessly we pursue it through new and exciting physical pleasures. The solution to the soul’s dilemma is to honor the body through right living and delightful asana practice but then turn inward settling consciousness at the heart rather than at the level of body or even mind. Where love and awareness meet, there is peace, wisdom, and rest for the searching soul. In the space out of time where no boundaries of Self exist, we begin to recognize that the emotions, thoughts and obstacles we experience are not who we are. We move out of the limitations of time and motion into an unclouded experience of expansion and bliss and we recognize the source and substance of our Self. This is the ultimate purpose of yoga and meditation, and indeed of life. Jennie Lee is the author of the new book True Yoga: Practicing With the Yoga Sutras for Happiness and Spiritual Fulfillment. A Yoga Therapist who has shared the healing benefits of classical yoga and meditation with thousands of clients over the past 17 years, Jennie helps people conquer anxiety, depression, grief, post-traumatic stress, attention deficit issues, eating disorders, and challenging relationship dynamics. She is a regular contributor to the Huffington Post, Mind Body Green, Yoga Therapy Today and more. She coaches by phone and Skype internationally. Connect with her on www.jennieleeyogatherapy.com, Facebook or Twitter.